The way he does it week-to-week varies, but the core concepts do not. This week Texas needed to not only contain TCU’s speed East-to-West and North-to-South, but they needed to finally show they could somewhat contain the QB. With the speed and the options TCU has at their disposal, Todd Orlando’s plan of execution was containing. Keep in front, bottle up, and then attack. Texas’ game plan for this boiled down to playing outside-in football. Attack the outside shoulder, set the edges, and force ball carrier to help inside. By constricting the pathways, this neutralized the speed TCU has and allowed Texas to capitalize on their strength. Todd Orlando told fans to expect missed tackles. As I pointed out in the above play, you had two, but what makes that alright is they were enough to slow down the defender for the reinforcements. Beckyn Hager is able to bull rush his guy back to set an edge for the play and Taquon Graham crashed down the line to make sure there is no cut back inside. This forced Darius Anderson into the waiting hands of the defense where Gary Johnson makes an excellent move to mess up the OG’s leverage and Gerald Wilbon just abuses the OC. Locke and Johnson set edges, the DEs either clog gaps or crash down, the LB is there to either stuff gap or stop counter/QB keep, and the NT abuses the interior. This constricted the space for the RB and forced him to slow down resulted in him running right into Chris Nelson. In fact, the nose tackle position bullying the interior of TCU’s offensive line was a huge reason Texas was so effective against the run. The ability of the NTs to either clog up gaps or straight up bust through them allowed Texas to hold TCUs RBs to 70 yards on 20 carries. Chris Nelson even had two tackles-for-loss. The only times this strategy broke down was when Shawn Robinson made Breckyn Hager pay for getting too aggressive and coming too far upfield, then cut back with an OG sealing off the backside LB or when Texas again got over aggressive and TCU made them pay with a counter that went for 15 yards. However, those two times were the only times Texas was burned by TCU on the ground. Other than that TCU was getting nowhere fast. Shawn Robinson still was able to make Texas pay on the ground. In the first half, he had 7 carries for 42 yards including two key conversions on third downs that allowed TCU’s only TD drive. However, the majority of his 57 yards on the game came on that TD drive where he gained 35 yards on three runs. This 11-yard run attacks the heart of Texas’ issue with the mobile QBs: recognition. Here we can see Gary Johnson recognizes the play, but that is because he’s watching the QB the entire way through. He sets the edge, but the rest of the team isn’t even looking for it. Once TCU gets that opening, Texas isn’t quick enough to cover for those mistakes. All-in-all that play was a very good call by TCU, playing on the tendencies of Texas to crash down on the screens. This 17-yarder was the biggest run for Shawn Robinson in the game and the one that set TCU up for their go-ahead touchdown. There is a way to break the outside-in defense and that is an option, and that is where TCU got its biggest run of the game. If the idea for the defense is to force them inside by setting the edge, then it is pretty difficult to do so against the option. As you can see in the video above, Locke tries to set the edge by taking away both the QB and the RB (mainly the RB to force the QB inside), but TCU was ready for that and sealed off the LBs. However, Texas answered this play in the second half by telling the edge setter to take the QB and crash down with the DBs like it’s a screen play. Todd Orlando did not trust that Shawn Robinson could beat Texas through the air. Especially not when Robinson was trying to read a defense and having pressure (even if it was illusory) in his face. Orlando did this by specifically attacking the interior of TCU’s offensive line. Texas lines up showing an even six-man blitz (three to one side and three to the other) with two high safety. However, the play changes as the ball is snapped. Coverage that showed quarters was switched to cover 3. The blitz then comes from the right side. I highlighted in the play how the entire offensive line on the right side was basically twiddling their thumbs, while the left side was trying to pass off the long sticking (DL blitz crossing over one or more gaps) NT and DE. Why choose the OG and OC? 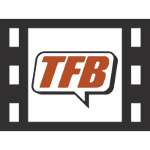 Because that is where Texas saw communication breakdowns in the film and by giving them that assignment, Texas saw it once again forcing pressure, getting a hit, and getting the ball back to their offense. While this was going on up front, Texas used a one-high scheme the majority of the game (That is cover 1 with man-over or cover 3) to combat both the run and pass. In these coverages, they gave the receivers plenty of cushion and drove to the ball when thrown, or they had safety help over the top. They used the box safety and the LBs to squeeze the intermediate passes or crash down if there was a run. Keep everything in front of you. If the pass rush does not get home or the QB gets off the pass the defender is still in control. We can see this during a more normal situation where TCU has 1st and 10 and not 3rd and 16 like above. This also happens to be the play where Caden Sterns got his second interception of the game (and his first too). CBs made sure they played over-the-top. The CBs are starting six yards off and turning hips early to keep over the WR. You can see this in the pictures above and below. Nothing behind you if you’re a CB. Texas took a few daggers from TCU in the pass game for 50 yards to Reagor and 39 yards to Turpin. The play to Turpin was allowed due to a wonderfully thrown ball and some luck on the side of TCU, but the Reagor catch is something we can take a closer look on. 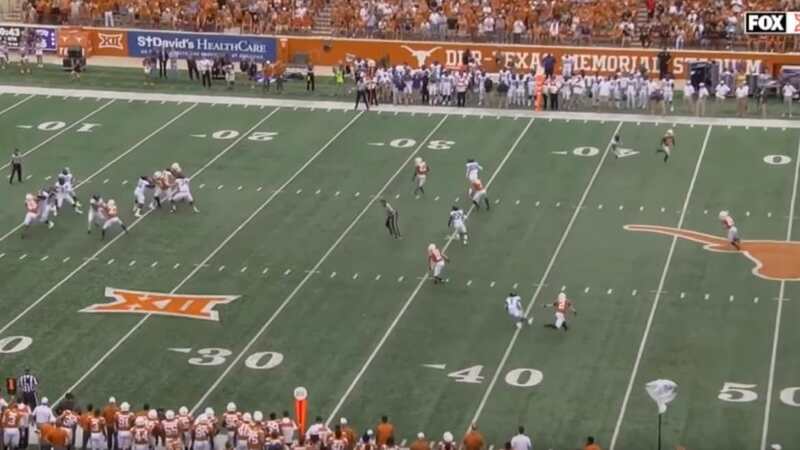 This is TCU’s biggest play of the game and as you can see Texas made an adjustment… Well more like Kris Boyd stopped getting his eyes caught in the backfield without help over top and the defense pressured Robinson. I’m sure he got an earful on that 50-yarder. If it were not for his tremendous athleticism and Texas getting pressure, Kris Boyd would have been a larger liability than he was in the end. This is a tough play to critique because the route by Jalen Reagor and the throw from Robinson were both pretty perfect. I’m still going to do it though. Everyone knows what’s coming. Kris Boyd still gets lost on the route. Kris doesn’t even try to get a jam or drive on the ball. He lets Reagor come at him, freezing his feet. Then it’s just too easy for Reagor to get separation by getting hands on Boyd first. While he got better in the second half, he plays with his eyes and relies on his athleticism too much. At the next level, crazy athleticism won’t cut it. I didn’t buy the hype on Kris Boyd going into the season. Four weeks in and I still don’t. Turnovers come off of mental mistakes. An offensive player makes a split-second mental mistake due to fatigue, anger, confusion, or lack of awareness. It is up to the defensive players to then make the offense pay for their mistake. Todd Orlando’s game plan did a good job of forcing the mental mistakes for Shawn Robinson through confusion and fatigue and putting his players in the correct spots. Making a young QB on his 4th start have to deal with changing coverages, constant pressure from lots of blitzes, and hit after hit (as was displayed in the play in the section “Pressure Passer”) will eventually lead him to make a mistake. It is then up to the players to complete the process, and Texas was up to the job. As I’ve explained above, Texas crashes down on the screen, but they leave a player over the top as a safety valve. When the motion starts, the safeties switch to balance the field, and the DBs crash down. Caden Sterns does not get caught up in the moment, understands his job, and gets back to the field. Orlando’s defense puts him in the right spot, he does the right thing, and they force a turnover. I was impressed with the play before the rewatch, and afterward, I’m straight up floored. He baited Shawn Robinson into trying to thread a needle. When pundits say a guy has “high football IQ,” they mean the player makes plays like the one above. They not only know what’s going on the field, but how to exploit it. This should have been a TCU touchdown. Texas is playing on their heels after TCU is marching down the field, and the TCU draws up the perfect play call to take advantage of Texas’ coverage. Luckily, Shawn Robinson got Brandon Jones and Jalen Reagor mixed up. On the whole, Texas’ defense did a tremendous job against an offensive concept that once put up 50 points on them. They allowed one touchdown off a few very well run plays called at the right time. Other than that, they stuffed Darius Anderson for 15 yards on 8 carries, they limited the TCU passing game to 197 yards (had 308 yards vs Ohio State), forced TCU to change their game plan, and played smart fundamental football with very few penalties. Texas’ defense may not be what it was last year, but they’ve played solid enough over the past two weeks to look pretty well put together. Keeping the defense and the offense rolling for the next two weeks will be crucial.